CALGARY, Sept. 8, 2018 /CNW/ - Team Germany took home the top prize today at the 2018 BMO Nations' Cup – one of the leading team show-jumping competitions in the world. The nation's riders were led by Chef d'Equipe Peter Hofmann. Nine of the best show-jumping teams in the world, each made up of four members selected by their national federations to represent their country, competed for the prestigious championship title. The course was designed by Olympic course designer Leopoldo Palacios of Venezuela; it featured 15 jumping efforts, covering 490 metres. "We're proud to work alongside great partners like the Southern Family as longstanding supporters of horse sports in Canada," said Darryl White, Chief Executive Officer, BMO Financial Group. "The BMO Nations' Cup has, yet again, showcased a world-class team show jumping event, and each of the nine teams competing here today performed exceptionally. This was another great year – thank you to the community and everyone that came out to support." It was a great finish for Germany. Team members Holger Wulschner, Andre Thieme, Philipp Weishaupt, and Marcus Ehning pulled off a top-notch performance and did not have to send out their last rider, solidifying a total of six faults over second place finishers, Team Canada. The BMO Nations' Cup is the only competition in which nations are represented by selected teams. Teams from participating countries may consist of three or four riders, and are led by a Chef d'Equipe. Each member of each team will jump one round over a course of 12 obstacles. The best three scores from each team are added together for a first round total. The top six teams return in reverse order of standing to jump the identical course in the second round. Again, the three best scores for each team are added to the first round total to determine the ultimate winner. In the case of equality of penalties for first place, the Chef d'Equipe selects a single team member to jump off. As the founding sponsor of Spruce Meadows, BMO Financial Group has a long and proud history of supporting equestrian sport in Canada. 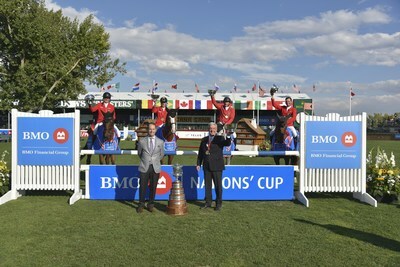 This is the 42nd year that BMO has sponsored the BMO Nations' Cup at Spruce Meadows, attracting the top international show jumping teams to compete in Canada. In addition, BMO has proudly sponsored Canadian Equestrian Team member and Olympic record holder, Ian Millar, for more than 25 years.